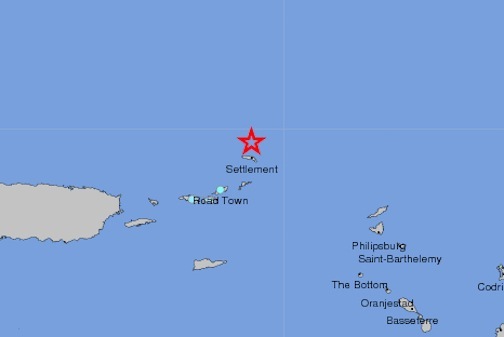 ROAD TOWN, Tortola, BVI – For the seventh time in eight days, a minor earthquake has registered on the ocean floor off the coast of St. Thomas, according to the U.S. Geological Survey. The U.S. Geological Survey said the earthquake occurred at 2:37 p.m. yesterday afternoon and registered 2.9 in magnitude on the Richter scale. The quake occurred 37 miles north-northeast of Charlotte Amalie. Thursday’s earthquake occurred closest to Tortola in the British Virgin Islands just 30 miles north-northwest of Road Town; 70 miles east-northeast of Fajardo in Puerto Rico; 78 miles east-northeast of Rio Grande, Puerto Rico and 86 miles east-northeast of Carolina in Puerto Rico, the U.S.G.S. said. The U.S. Geological Survey said the earthquake occurred at 9:11 p.m. Wednesday and registered 2.5 in magnitude on the Richter scale. The quake occurred 63 miles to the northeast of Charlotte Amalie.